The Admin Center controls the set-up and management of your TIM Tools site. Once you are signed in to your TIM Tools instance, you will see an Admin Center link in the upper right corner of your screen. Click the link to access the Admin Center. The Admin Center is, of course, available only to members with administrator status. Figure 1. TIM Tools menu as seen by a Super Admin. Note that users assigned to other roles may see fewer options, depending upon the permissions granted for their specific roles. The Admin Center is where you will find everything you need to enter your schools and teachers, and manage the use of the tools. 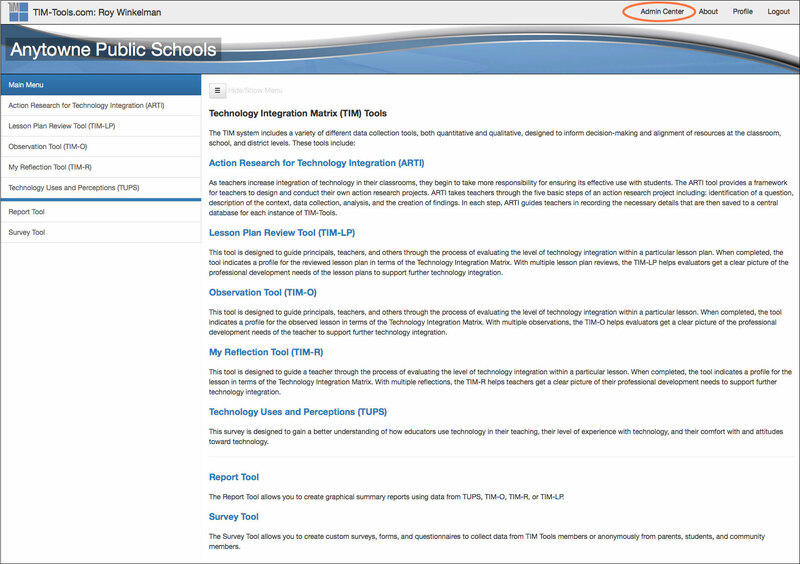 You will find helpful information embedded throughout the Admin Center. You could easily skip reading this manual altogether and find your way around the Admin Center just by exploring.